Japanese Tea Story : Not Thin, Crispy and Toasted "English Toast"
Not Thin, Crispy and Toasted "English Toast"
When I hear “English toast”, it reminds me of thin and crispy toast. Marmalade is spread on toast and have it with a nice cup of tea for breakfast in the UK. Sounds very English morning to me. “English toast” in Japan seems to be different. Actually, I didn’t know it and I have never tried it. It is a local product, by KUDOPAN Co.,Ltd, particular to Aomori prefecture in Japan. I heard it's so popular among people in Aomori, the northernmost prefecture on the main island. As I mentioned, I didn't know it, but everyone there knows it. What is it like? Even if I haven’t tasted it, I can easily image the taste because it’s a sandwich with spread margarine and sprinkled granulated sugar, and not toasted. In Japan, round top bread is called “English sliced bread”. 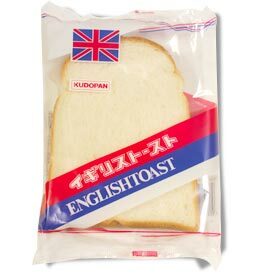 Since this type of bread is used for the products, it’s called “English toast.” I still don’t know why it says “toast” though. Sounds like it's their "comfort food" or "soul food". The prefecture is far from my place, but if they insist…I have to try when I have a chance.